Spinning for the Guild Challenge. IN June at the last meeting of the guild before summer a guild challenge was arraigned. It is called Fiber Poker. the Ide is to get you out of your comfort zone and get you to try something different. In my case I am playing spinning poker. There are several stacks of cards and you have to pick one from each to get your challenge the stacks represent different aspects of yarn: colour, fiber, type of yarn, general design. I picked colour: two colours; fibre: goat; type of yarn: 3-ply; general design: include beads. the roles say you can return one card and repick but that it but just one. 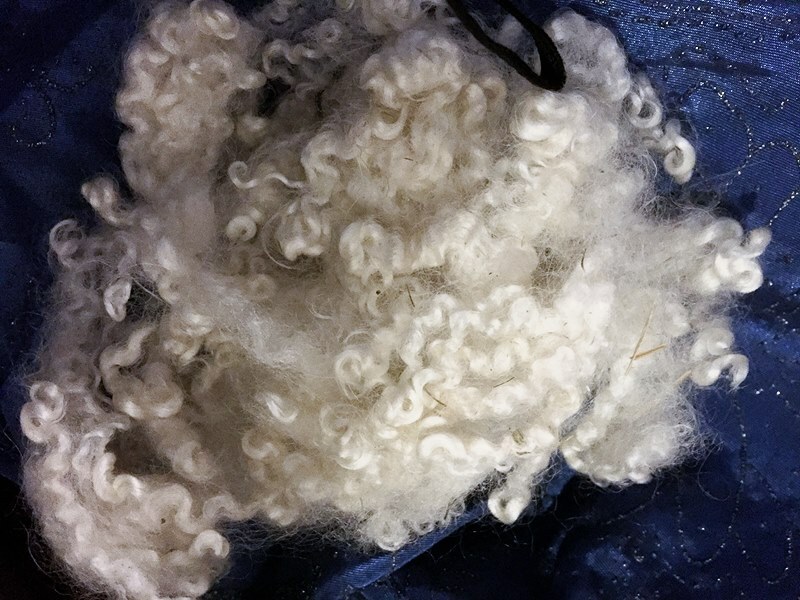 The first step was to get some Mohair. I got some combed top and some locks. 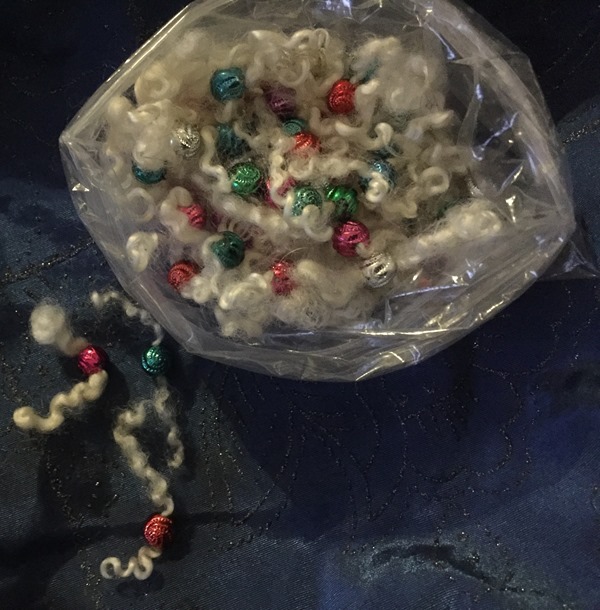 I decided that the easiest thing to do was thread beads onto the locks and them spin them in as I go. 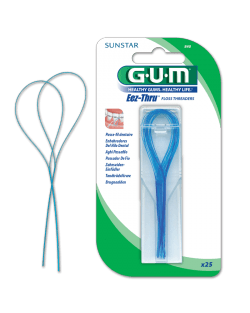 I used this handy tool that is for helping to floss your teeth when you have braces. The top was sticky so not easy to spin. I did manage to add some beads but it was a struggle. I took it off on to an empty weaving yarn cone. I have the second single done. I have one more to go. Originally I thought I would do a navaho or chain ply to get my 3 ply but I think the beads being large would end up making very frustrating. I think it may be very frustrating anyway. We will see. You will notice that there isn’t much yarn with beads. It will be a very small skein of yarn but there was no min length so this will do. I am not enjoying the spinning but that’s ok . Now I have tried it I never have to again. 😀 I have to have it done by September 11. I think I will make it. 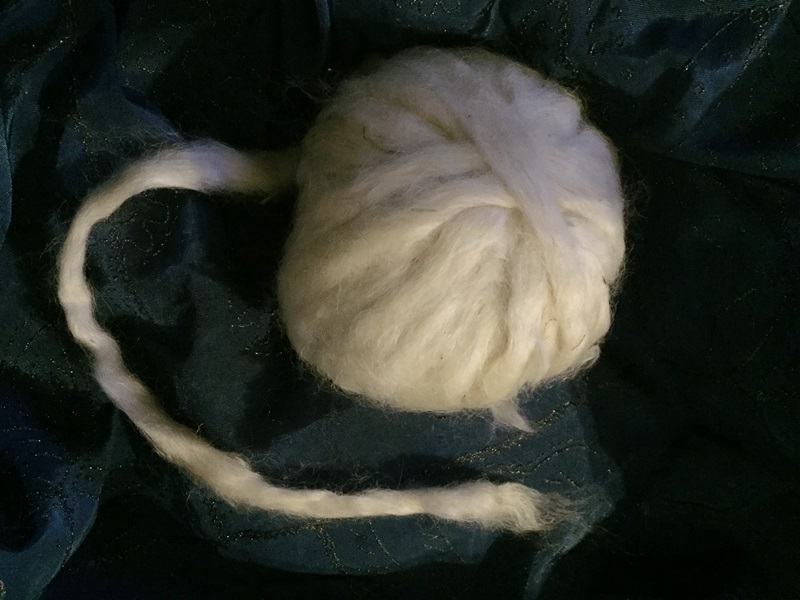 This entry was posted in Challenges, Spinning, Uncategorized and tagged Guild Challenge, mohair, spinning, spinning with beads. Bookmark the permalink. 14 Responses to Spinning for the Guild Challenge. Oh gosh, the beads… that must be tricky to get right! they aren’t really very heavy but they are anchored in place. I fluffed up the ends other locks and poked them through the top and spun the lock in so they won’t move. This will just be a small sample. 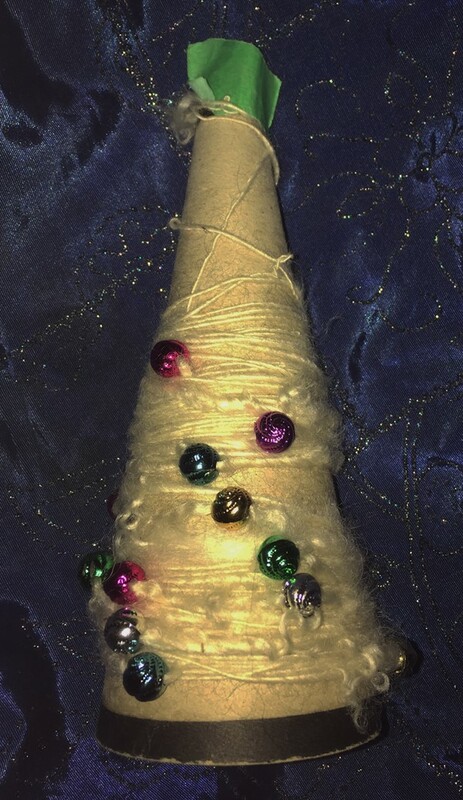 It might work to make the bobbles on a Christmas tree picture. Looking forward to seeing what you make with this! It’s good to work outside of your comfort zone – sometimes it’s inspiring and sometimes it’s not – but it’s always worth a go. I’d love to see the finished yarn sample. It is good to try new things. I think I will try some beads with some different fiber. I will show you when its done. Wow that’s quite the challenge Ann! I can imagine what patience it had to take to not only bead the locks, but spin them. Good for you. I look forward to seeing it finished. Thanks Marilyn, l will post a picture of the finished yarn when its done. It was a challenge. I think I will try it again but with different wool, maybe use a beaded thread for plying. I put back pink and blue. That would have been to much.